Vinegar plays a big role in not only preserving but also in all types of cooking. Acidity is a vital part of balancing a dish. It is something we all take for granted, picking up a bottle of vinegar and adding a splash over a salad or a glug into a pan after sweating down some onions. 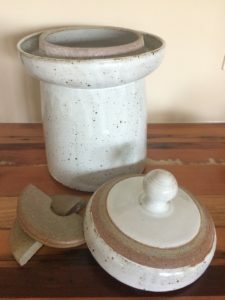 How is it made though and can you make it at home? 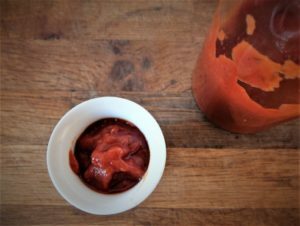 The simple answer is yes you can make vinegar and it is simple enough to do right in your kitchen. Vinegar starts out its life as an alcohol. You may have used red wine vinegar, white wine vinegar or apple cider vinegar before. Before being turned into vinegar you need a base with alcohol in it so in these cases red wine vinegar starts out as red wine, cider vinegar starts out life as hard cider. The process that turns alcohol into vinegar is fermentation. Funnily enough, fermentation has already been carried out to turn apples into cider. Cider is made when yeast turns the sugars in the apple juice into alcohol. Vinegar is made when the alcohol in cider is turned into acetic acid by acetobacter, a type of bacteria that feed on ethanol which creates the by-product acetic acid. This is the main thing we need to know to understand how to make our own vinegar, so, with this in mind let’s find out how we can get acetic acid bacteria to work for us. We now need to work out how to introduce acetobacter the acetic acid producing bacteria to the cider. This, in fact, is a process that will occur spontaneously if you leave an alcoholic beverage exposed to air (although I don’t recommend this method, a more controlled way will be detailed below) acetobacter will develop on its own. Acetic acid-producing bacteria require oxygen and develop on the surface of cider or wine. This is why if you leave an alcoholic beverage open for longer than a few weeks you may find it will start to turn sour. This is acetobacter beginning to work. In this undesirable case, the alcoholic beverage has been exposed to oxygen and acetobacter is the first to gain a foothold. Acetobacter grows in the area where the cider is exposed to the air. The first two requirements can easily be achieved by leaving the cider in a bowl rather than a bottle which increases the surface area of the cider exposing more of the cider to oxygen. Acetic bacteria also need time to reproduce, grow and begin turning the alcohol in the cider into acetic acid, thus producing vinegar. Depending on the conditions of fermentation it will usually take 2 – 4 weeks for fermentation to fully acidify the alcohol. Like any organism, acetobacter thrives best at certain temperatures. By keeping the cider around room temperature, or between 15 – 35°C / 60 – 94°F you create an environment that is perfect for the acetobacter to ferment the cider vinegar. The best way to make apple cider vinegar is in a controlled way. I have seen some examples where acetic bacteria is introduced just by leaving cider exposed to the air. This is a perfectly valid way to make cider vinegar, however, the acetic bacteria takes a lot longer to get started as it has to come from the atmosphere, it also has to compete with other bacteria to establish itself. This method leads to inconsistent results and overall a lower quality finished cider vinegar in both taste and flavour. Fortunately, we have an easy source of acetic bacteria in the form of ready made apple cider vinegar. Apple Cider vinegar is often sold unpasteurised, this means the bacteria that we want is available in commercially available vinegars. By dosing unpasteurised cider vinegar into alcoholic cider we are introducing millions of viable acetic acid producing bacteria that will soon reproduce and work to ferment the cider into more vinegar. Vinegar cultures are also commonly stocked at home brew shops. As a general rule of thumb, you will want to add around a quarter of the volume of vinegar to the volume of cider you want to ferment into vinegar. For example, if you are fermenting 1 litre of cider vinegar you will want to add 250ml of unpasteurised cider vinegar as a starter culture of acetobacter. Once the starter vinegar is added it is now just a matter of covering the cider with a cloth to protect it from insects and so nothing can fall in but at the same time allow the cider to be exposed to the air. The bacteria will multiply and begin consuming the alcohol turning the cider into vinegar. During the fermentation of the vinegar, you may notice the cider will turn hazy and a gelatinous layer form in the vinegar. This is basically a colony of acetobacter and it is perfectly normal to find. 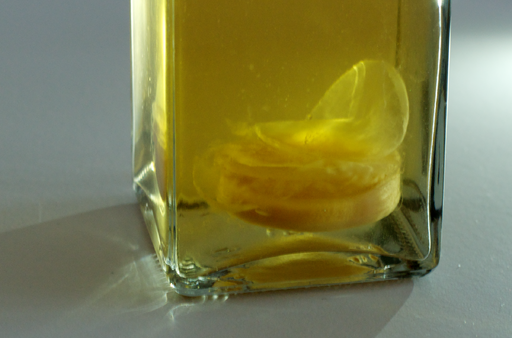 If you buy unfiltered, unpasteurised vinegar from the store you can sometimes find a mother has formed in the bottle. As you ferment your own vinegar you will likely have one form in the cider, the mother can be transferred from one batch to the next should you wish to make more vinegar. It is composed of cellulose and acetic acid bacteria and is absolutely harmless although it can look a little undesirable. Depending on all the variables we talked about before it can take between 2 – 4 weeks to fully ferment your vinegar, it can take a little longer if you do not use a starter as the acetic bacteria take time to establish themselves this is why I recommend an apple cider vinegar to start your vinegar. The decreasing alcohol should let you know when there is very little or no alcohol left as the acetic bacteria ferment the alcohol out. This is a perfectly feasible way to test the acidity of your vinegar, other methods that are more precise require titration which will give you an accurate acidity level by comparing the pH to a base solution. This is not required if you are just using the vinegar to dress salads or in cooking. Once you are happy with the level of acidity it is time to bottle and seal the vinegar. It is important to stop the fermentation when the vinegar is ready and all you need to do is to keep the air away from the apple cider vinegar. Acetobacter requires oxygen to work so by bottling the vinegar and capping, you remove the oxygen and the acetobacter stop working. If you leave the cider vinegar exposed the acetic bacteria will actually work to reduce the acidity of the cider vinegar which is not what we want. If the acidity is too low other microorganisms will take over from the acetobacter and the cider vinegar will spoil. You can also pasteurise your homemade cider vinegar by heating it to 60°C / 140°F. This is not necessary as long as you store the finished vinegar in an airtight container. It will also remove the acetobacter which does have beneficial health properties. 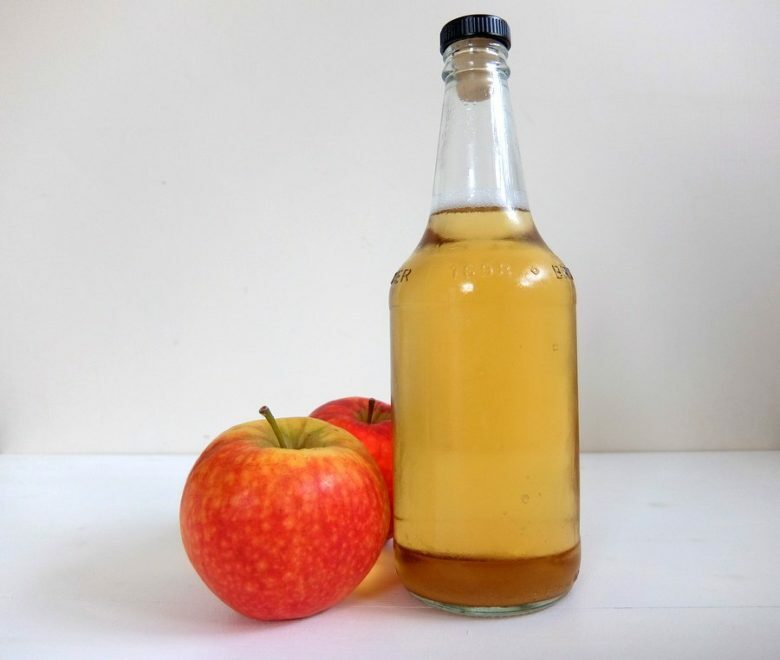 There is not much effort required to create your own cider vinegar and if you regularly buy some it is well worth experimenting with making your own. The following recipe will make just over a litre of cider vinegar. 1. To make the cider vinegar pour the hard cider into a large wide bowl with enough capacity for the cider and vinegar together. 2. Add the unpasteurized cider vinegar and mix through. Cover with a cloth and secure around the bowl with string or a rubber band to stop flies or dust from getting in. 3. Allow the vinegar to ferment for at least 12 days checking on the progress by smelling and tasting periodically. Fermentation can take up to 4 weeks. 4. Once fermentation is complete bottle the apple cider vinegar without the mother (the mother can be added to a new batch of cider to make more should you wish) and seal with a cap to halt the fermentation. As the bacteria are still present in the vinegar a new mother may form in the bottle, this is not harmful and perfectly normal. It should be noted that as we won’t know the exact acidity of this apple cider vinegar it is not suitable for pickling. For more information check out this article about pickling vinegar. 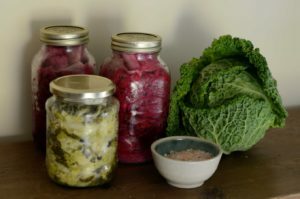 What Is Lactic Acid Fermentation & How Does It Preserve Food? I’m wondering….What if you simply start out with some fresh organic apples straight from your yard or a local farm which are already naturally inoculated with the bacteria that will be needed to ferment and crush them up and begin the process of converting to alcohol and then to acetic acid and stir it up a couple of times a day to keep the process going? No need to inoculate it with additional cider vinegar because there are already plenty of acetic acid bacteria on the apples already. Does that sound reasonable? First of all, the apples would need to ferment to cider. This would mean that yeast would have to outcompete all the bacteria that is on the apples to first make the cider. If this happens without spoilage you could then leave the cider exposed to the air to encourage acetic bacteria to grow once the yeast has finished. This would work theoretically, however, all throughout these two fermentations there is a chance other bacteria such as lactic bacteria or pediococcus would get established. This would create a lot of undesirable flavours so I am not sure I would recommend this.